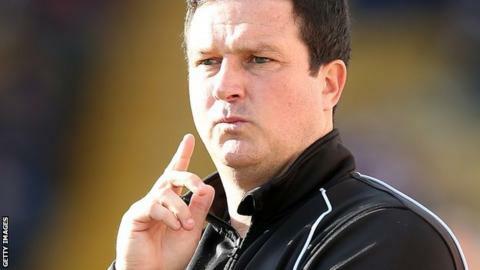 Mansfield Town boss Paul Cox is already looking at trialists as he bids to strengthen his squad for next season. The in-form Stags are currently 10th in League Two with four games to go, and could still mount a late play-off challenge. "We have got trialists in at the minute who we want to make decisions on before the end of the season," Cox told BBC Radio Nottingham. "I have a nucleus of players I want to keep, but also those I want to sign." Mansfield have lost just once in nine matches on their travels since the turn of the year, a 3-0 defeat at Oxford United on 15 February. He added: "But some of the trialists will be coveted by other clubs, so I'm trying to keep them under my hat at the minute." Mansfield go in search of their fifth straight win at Accrington Stanley on Good Friday after beating then-league leaders Rochdale 3-0 at the One Call Stadium last weekend. Another success would keep them in the hunt for the top seven with rivals Oxford and York playing each other. Mansfield led 2-1 going into injury time when they hosted Accrington in December only to to lose 3-2, but Cox said there are no thoughts of revenge. "We are in a different place mentally to what we were then. "If we are within three or four points within the last two games then we have a chance [of the play-offs]. All we need to do is stick on the other teams' heels. "The worst case scenario is we miss out, but we still want to finish our first season in the Football League as high as possible."